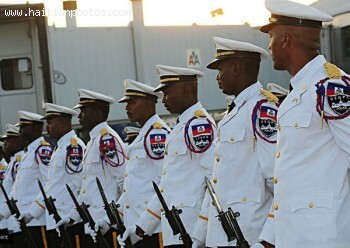 As per the announcement of Emmanuel Corvil, the Inspector of Police and the Chief of Service Staff from the National Police Academy, in accordance with the guidelines for recruitment that became effective from 1999, the Haitian government will recruit 1000 new police officers in the 2013-14 academic year. This appointment is a part of the planned program under the 'National Development Plan of Police (2012-2016)' to recruit 1000 new police officers every year. Any aspiring candidate, regardless of gender, may submit own application for the post of "Police Officer" to any of the 16 commissariats within the country or at the departmental directorates of the National Police of Haiti (PNH) excepting the Department of Northwest in Port-de-Paix and Mole Saint-Nicolas. The 17th anniversary of the SWAT team of the Haitian Nation Police was a noteworthy affair for the Haitian government, as Prime Minister Laurent Lamothe paid a visit also in his capacity as the National Police's Superior Council President. Lamothe, in a briefing with the press, stated that the elite team was very important to the Haitian Police and needed the support of leadership in carrying out their duties well. He made the mission of his visit to figure out the requirements of the tactical team and to aid in the beefing up of the nation's security. French Ambassador's Ambitious Traffic and Pedestrian Safety Project. In an effort to reduce traffic accidents and improve pedestrian safety, the Ambassador of France, Didier Le Bret, gifted the National Police of Haiti (PNH) with two legacy speed radars and a set of breathalyzers. This bequeathment occurred at the graduation ceremony at the Police Academy, where 17 certified instructors will use the speed traps, while on speed patrol, to detect speeders and administer the breathalyzer test. During the two-week intensive training, two French police and a representative from the UN Police (UNPOL) demonstrated use of the computerized devices. In a second phase of the traffic and pedestrian safety project, the French Embassy has developed a proactive program for Haitian school children to learn pedestrian traffic safety rules. The training will progress one school at a time, beginning July 27th. In Petion-Ville, instructors will teach the students at Ecole Jules Verne Premier, its pilot school. The trainers will screen a training film and then invite students to share their observations and ask questions. A French UNPOL will moderate the discussion and a pedestrian code of conduct pamphlet will be handed out at the end of the session. The school children will be encouraged to share and discuss the information with their parents and other family members. In Haiti, security has always been a problem due to the lack of it. To address the issue, the Haitian government, in the entity of its senators, assigned the former director of the judicial police, Godson Orelus, to be the new Director General of the National Police of Haiti (PNH). Of the 18 senators, 17 were in favor of this presidential decree while only 1 senator abstained. Orelus replaced Mario Andresol for the position. Earlier this month, Godson Orelus was officially given his new position and office in a ceremony at the PNH Police Academy. It was attended by Haitian Prime Minister Laurent Lamothe, Minister of Justice and Public Security Jean Renel Sanon, several high-ranking officials of the PNH, civil and religious officials and personalities, as well as the representatives of several international institutions, organizations, and other nations. Almost 80 national police officers in Haiti are up for dismissal for being involved in various controversies and issues. This is a process called Vetting. This was confirmed by a report submitted by the United Nations Mission for Stabilization in Haiti (MINUSTAH), recommending the dismissal of certain police officers. The report was given to Justice Minister Jean Renel Sanon and Chief of Police Godson Orelus. Haiti National Police spokesman Frantz Lerebours said that the police officers will be fired for various offences such as corruption, dereliction of duty, human rights violations and insubordination, among others. The vetting report said that some police officers are accused of corruption because of the fact that they live a lifestyle that is unreasonable for the amount of salary they get. A case involving the death of a State University of Haiti student has moved forward with the indictment of National Penitentiary Administration agent Pierre Paul Maceus. Government Commissioner Me Lucmane Delile headed the indictment, saying that there is enough evidence showing Maceus' involvement with the death of 4th year student Damael D'Haiti during an event conducted by the Faculty of Law and Economics. Maceus is a young officer who was also a student at the university. According to previous reports, Pierre Paul Maceus was at the event too and had an encounter with the victim. Delile, however, said that the Central Directorate of the Judicial Police has yet to recover the weapon used to kill D'Haiti. The Haitian Coast Guard which is the Marine Unit of the National Police Unit of Haiti is one of the best things the country has ever had in a very long time. It is the only reason why there are eventful and success in what the country is trying to achieve as they play a very big role in their work. Among the many things the police unit has been able to achieve is a good and functional coast guard service unit that is very much functional and efficient at what it does. The Haitian National Police (HNP) is an independent agency force that was originally organized under the directorship of the Haitian Army during Jean-Claude Duvalier's rule. By 1995 the Haitian Army was dissolved; and the HNP became an independent policing agency. Once Haiti had retired its army by 1995, Port-au-Prince and rural areas were left without adequate police protection. What happened next has been the single biggest factor to prevent the HNP from being an effective policing body. Former military officers (MO) of the Haitian Army infiltrated and have since influenced the politics of Haiti National Police, particularly in the area of human rights, an essential part of modern law enforcement. The Haitian National Police, founded in 1995 and the official law enforcement agency of Haiti, also acts as the country's military force. Half a dozen countries, including the U.S, have trained nearly 9,000 police officers in current law enforcement methods. Training includes crowd management, firearms use, and dignitary protection. When dictator Jean-Claude Duvalier ruled, Haiti's police force was an arm of the Haitian army, 14,000 recruitments strong. In 1987, Haiti amended its Constitution and mandated Haitian police were to act as peacekeepers, law enforcers, protectors, and arresters of lawbreakers. Problems preventing the police from fulfilling these duties were a mixture of military bullying, internal warfare, and lack of civilian oversight. The 1987 Constitution suggested an independent police force be created as part of the Ministry of Justice. But this reform has never happened. The Haitian Coast Guard (HCG), a division of the Haitian National Police, operates as a police department at sea, while performing coast guard operations. Two decades after the Haitian Navy became obsolete; the HCG was organized with two small defense boats and an American yacht. Over the years, the U.S. leased the HCG several sea vessels. When any of the vessels were destroyed in conflict, the U.S. sent replacements. During Duvalier's reign in 1970, newer vessels, leased by the U.S. to Haitian Coast Guard, experienced revolts aboard ship, and bombed the Presidential Palace in the capital of Port-au-Prince. Forced to retreat to Guantanamo Bay, the U.S. reclaimed the vessels, but then returned them to Haiti, much to the elation of Duvalier. He designated the HCG as the Haitian Navy and tried to develop it into a more formidable operation, but failed. The U.S. continued leasing vessels to the HCG as well as reclaiming boats with expired leases.